Heat oven to 400°F. Spray 11x7-inch glass baking dish with cooking spray. Place cookie sheet on lowest oven rack to catch any spills. In 10-inch nonstick skillet, cook bacon over medium-high heat, stirring frequently, until crisp; remove with slotted spoon to paper towels to drain. Discard all but 1 tablespoon drippings. Cook chicken, salt and pepper in bacon drippings over medium-high heat 4 minutes, stirring occasionally. Add onion and cook over medium heat 5 minutes, stirring occasionally, until onion is tender and chicken is no longer pink in center. Stir in carrots, corn, broth and mustard. Heat to boiling; boil 1 minute. Remove from heat. Stir in bacon. Spoon into casserole. Remove pie crust from pouch; unroll and cut into 1 1/2-inch-wide strips. Lay 3 longest strips lengthwise over filling. Lay remaining 4 strips crosswise, trimming to fit pan. Brush crust strips with milk. Bake 30 to 35 minutes or until crust is golden and filling is bubbly. Sprinkle cheese evenly over crust strips. Bake 1 to 2 minutes longer or until cheese is melted. Sprinkle with parsley. Asiago cheese is an Italian cheese, semi-firm in texture and slightly nutty in flavor. 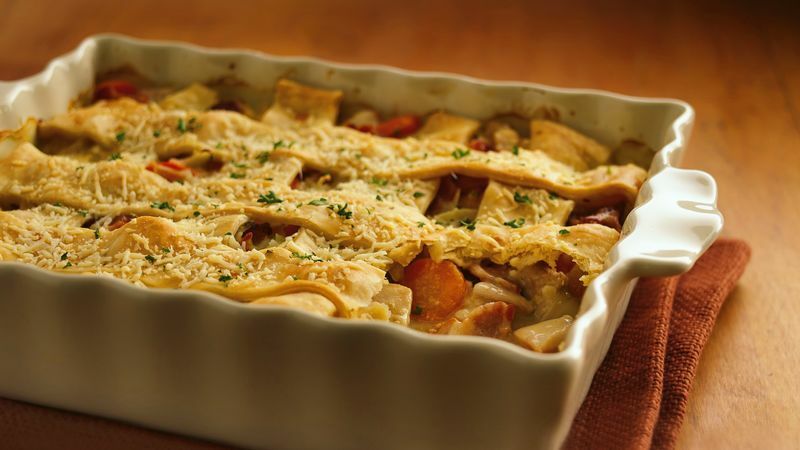 It adds a nice unexpected flavor to the pot pie crust. Freeze leftover chicken broth in an ice cube tray. It will then be convenient to use anytime you need a little bit of broth.